Audio Muse Returns with Fall & Winter Jams! 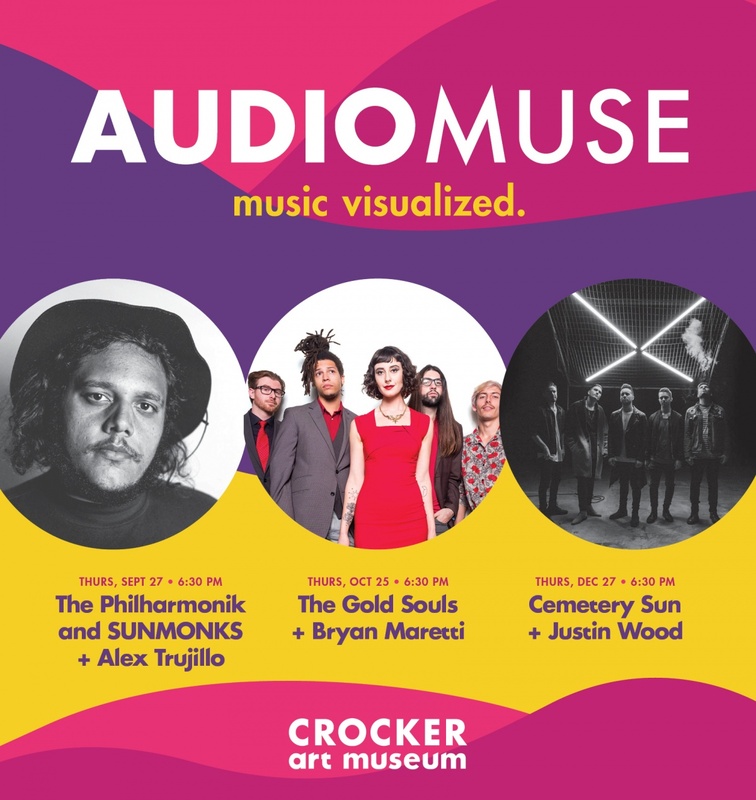 Audio Muse is the Crocker Art Museum's new monthly music series. Visualize the music as the region’s best bands perform alongside digital, video, or new-media artists for multisensory concerts that rock 'til 9 PM. Enjoy food and $6 drink specials from Crocker Cafe by Supper Club. This series is sponsored by Blanket Marketing Group. Audio Muse is like seeing a band at a club, but even better with unique visual elements you aren’t going to see anywhere else. Blending the energy of ArtMix with a healthy dose of nightclub vibes, Audio Muse will transform the Friedman Court into a high-energy, all-ages concert venue. Combined with the visual elements, this show will be a musical experience unlike any other in town. Click here to buy a member or nonmember series pass to 3 shows for the price of 2. Kicking off the fall season of Audio Muse, the Crocker is excited to announce a collaboration between Sacramento-based Sunmonks and The Philharmonik. The Philharmonik is known for his electrifying live performances and smooth, hip-hop sound. His combination of piano talent, fresh beats, and poignant lyrics mixed with the 70s pop, soul, and R&B of Sunmonks will leave audiences buzzing. Installation artist, designer, and illustrator Alex Trujillo will illuminate the night with a new LED light-sculpture show. Hailing from Sacramento, The Gold Souls are an innovative and bluesy soul band that draw from a variety of influences to deliver compelling lyrics and fresh arrangements through a vintage sound reminiscent of old-school jazz. Playing everything from original, emotive tunes to classic blues covers, The Gold Souls and the sensual voice of its lead singer, Juniper, whisk audiences away. New media artist Bryan Maretti will bring his unique work, combining different visual effects in animation and video, creating patterns and shapes. Reserve your tickets HERE! A mixture of alternative, pop, and electro, Cemetery Sun delivers a musical concoction that is as distinct as it is irresistible. Weaving together a spacey production, thick beats, and airy guitars, their pop-punk sounds intoxicate and delight. Justin Wood, Stanford MFA grad and new-genre artist, will craft digital manifestations, stitching the gap between light and sound.